YouTube SEO is a MUST! What are YouTube Video Tags? YouTube can be your goldmine, but only if you manage to make your channel popular. Getting genuine views is something that requires a LOT of hard work. Even if you make a huge number of super-interesting videos, useful for the users, it doesn’t mean that you’ll get enough of views. Your effort will go to waste unless your videos don’t reach your potential audience in the first place! So, how to make sure your videos get views? One of the best ways of doing that is by optimizing your content for search engines, and in today’s guide we are covering YouTube Tag Optimization! By mastering the simple process we teach, each video you make will receive with better treatment from YouTube Algorithms. Search Engine Optimization or SEO is the process of making your content search-engine friendly. If you do your SEO job well, you can be sure that your videos will rank very high on the search results page on YouTube! How are you supposed to explain your video to the YouTube? Using keywords that describe your video the best! Because keywords are one of the most important factors that YouTube algorithms use for ranking, you need to make sure you use the right ones. By that, we mean that you need to do a proper keyword research and find the words and phrases that users frequently search for. Once you find the best keywords for your videos, it’s time to use them. In this guide you’ll learn how to use tags on YouTube to get more views and exposure! If you’ve ever uploaded a video to YouTube, you must have noticed the tag option. This feature has been there for ages, but the truth is that not many people even know what it is. If you’re one of them, we’re gonna help you learn everything about YouTube tags, starting from the very beginning! Tags are basically keywords that you can use to better explain the subject of the video. Tags are the words and phrases used for helping YouTube algorithms understand better what the video’s content is about. For example, if your video is dealing with makeup tips, usually tags like this are used: “makeup”, “beauty”, “makeup tips”, and so on. Unfortunately, the things are not so simple, because in order to get the most of YouTube tagging, you need to choose proper keywords! What tags should you use on YouTube? Using common sense when choosing the tags is a pretty good option. The bad news is that it might not be enough to help you rank better than your rivals. This is especially true if your video is dealing with a popular subject. That is why it is essential to find the keywords that are very popular among YouTube users, but which are also not commonly used by your competitors. So, what tools are there to generate a list of tags? Unfortunately, since 2014, the official keyword research tool of YouTube is no longer available. To get a good idea about which keywords people are looking for, Google recommends it’s official tool Keyword Planner. Although this tool is focused on search results on Google exclusively. As you can see, Google doesn’t release exact accurate search volumes for keywords. Also keep in mind that search volume presented in image above is only for Google searches. Unfortunately, there isn’t a tool that provides search volume for YouTube, so we just have to assume how much volume keywords have based on data we can get. 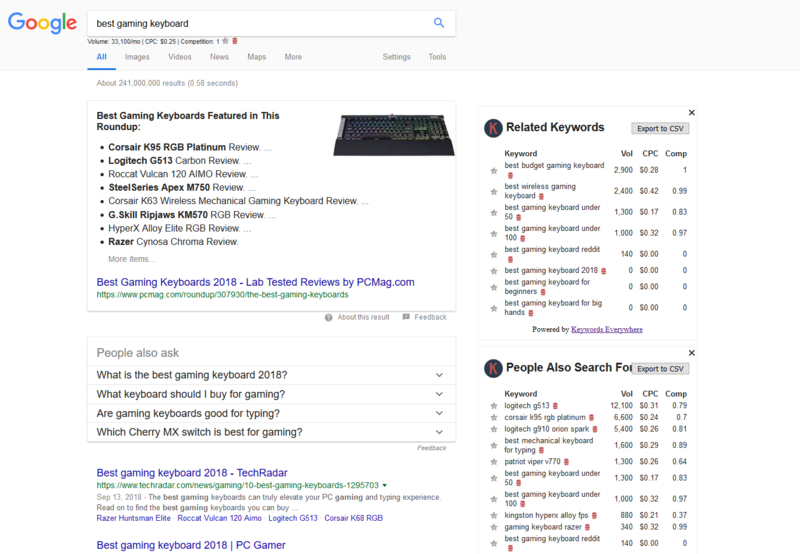 Google Keyword Planner is not the best solution for finding YouTube keywords, but it’s free so we still suggest using it as part of your arsenal. There are other amazing keyword research programs out there, which are also free of charge, that are going to provide you with lists of most popular tags for your niche. This is a completely free tool that you install as a browser extension (Chrome or Firefox). Biggest advantage of this tool is that you don’t have to leave YouTube.com. Anytime you search something on YouTube or Google, it is going to give you search volume for keyword you searched on your screen. Just because of the feature of giving you exact search volume it’s worth having this tool. When you search something on google, you’re going to see related keywords and keywords that others search for. This is a free online tool that will help you find perfect keywords for your YouTube tags. The best thing about this keyword generator is that it’s super easy to use. In fact, all you got to do is type in a word that best describes the video you are uploading, choose the targeted country and language, and click search! After clicking the search button, the tool will provide you with a list of keywords, ranked by the search volume. Unfortunately, in order to get additional info, such as the exact number of monthly searches, estimated cost-per-click, and competition, you will need to become a paid member. But in reality you don’t need the additional info so I recommend just sticking with free version. Here’s another great keyword tool. Recently Ubersuggest has been acquired by Neil Patel, who then upgraded it with lots of features and is still free for everyone. For YouTube tags, the feature we need is Keyword Ideas, as you can see on the image. Feel free to play with this new upgraded tool and it’s other features, the thing I like the most is the simplified competition checker. So before you even make a video, you can see what you will be dealing with in terms of other videos out there. We got the tools you need covered. Now’s the time for the action. So, how to choose the tags that are going to perform good? These are general guidelines to steer you in the right direction. Out of the total 30-50 tags we end up with, many of them will be very different in terms of search volume and competition, so let the metrics just give you a general guideline. Think of the words that would describe your video the best. If there are longtail keywords that the users are searching often, you need to use them! This means that if there’s a phrase that explains in detail what your video is about, you must include it in the YouTube tags. Plug all seed keywords you thought off 1 by 1 in the tools above and write down all the tags you like. I’d recommend writing down total of 30-50 tags and maximizing the 500 character limit. This is how it looks when you see other videos with VidIq browser extension. You can freely see video tags they are using. If your rivals are getting much more views than you, it means that they’re doing something right. The chances are that their SEO is pretty good. You can get a very good idea on which tags to use for your videos by taking a peek at your competitors! To do that, you will have to use software that can uncover the tags. This is because YouTube does not show them to everyone. VidIq and TubeBuddy, for example. Both tools come in the form of a browser extension. Use this to check videos that are already ranked and get some ideas for your own tags. Did you know that the word “selfie” didn’t enter the Oxford English Dictionary before 2013? This is just one example of new words which popularity is increasing extremely fast. In fact, according to the OED, about a thousand new words are added every year! So feel free to use words that might not even exist, you might make the next trend! How many tags does YouTube allow? YouTube allows you to use up to 500 characters in the tag field. This means that you won’t be able to use all the keywords that come to your mind. Does the order of the tags you type in into the tax box matter? Whole point of this article is to satisfy the algorithm that rank the videos in YouTube’s search engine. Our recommendation is to put in the most relevant tags first. Best YouTube Tags for Music or Gaming? Many people are searching for specific tags for certain niches or industries like music and gaming. Unfortunately there is no specific tags for each niche, you will have to approach each video you make as something new and make a list of tags yourself. 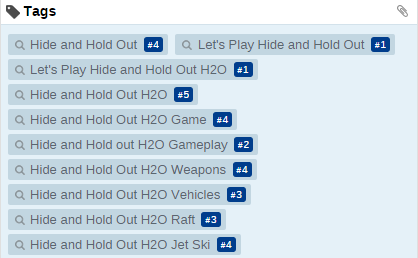 That would be it for the tags, I hope I answered your question on what tags to use on YouTube. 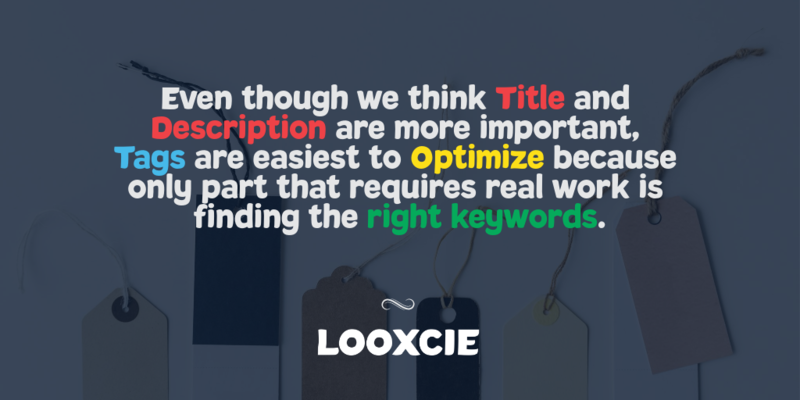 But tags aren’t the only thing to optimize for, as I mentioned above, Title and Description might be even more important. I already have a guide for writing YouTube descriptions.